Police said the death is not being treated as suspicious. A body has been found on Cleveleys beach, say police. The body was found on the stretch of beach near to Victoria Road West at around 8am on Tuesday, October 10. 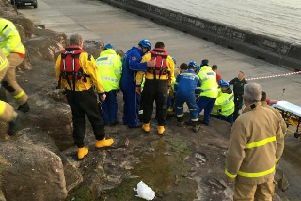 A spokesman for the police said: "We were called this morning to reports the body of a man had been found on the beach. "The man has yet to be formally identified, but is believed to be aged in his 40s." Police said the death is not being treated as suspicious and a file would be passed to the coroner.